In stock -This product will ship today if ordered within the next 8 hours and 43 minutes. 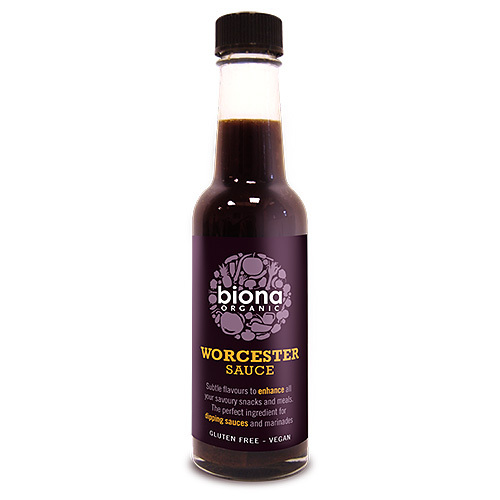 Biona Organic Worcester Sauce has a subtle flavour to enhance your savory snacks and meals. The perfect ingredient for dipping sauces and marinades. Water, Vinegar*, Raw Cane Sugar*, Molasses*, Balsamic Vinegar*, Tamarinds*, Tamari* (Soya Beans*, Sea Salt), Onions*, Sea Salt, Blackcurrant Syrup*, Garlic*, Oranges*, Chilli*, Red Pepper*, Ginger*, Cardamon*, Coriander Leaves*, Cinnamon*, Basil*, Parsley*, Coriander*, Nutmeg*, Black Pepper*, Cayenne Pepper*, Pimento*. 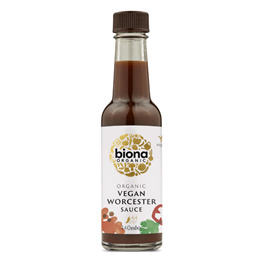 Below are reviews of Biona Organic Worcester Sauce - 140ml by bodykind customers. If you have tried this product we'd love to hear what you think so please leave a review.